1. Does the group meet apart from match days? The Iron Lion Firm is what you make of it. We have viewing parties (away OCSC matches and major international FIFA games), member only events, parties, volunteer/charity events and get together's throughout the year. If you only wish to chant, wave flags and be a part of the ILF during game day that is fine and we welcome you on board. The Iron Lion Firm however is a family and we have activities throughout the year. See our events page for a calendar of our events. Membership to the ILF costs between $15 and $25 depending on the type of membership you choose. We use this money to finance the various efforts we make to support our team like tifos and offsetting away trip costs. 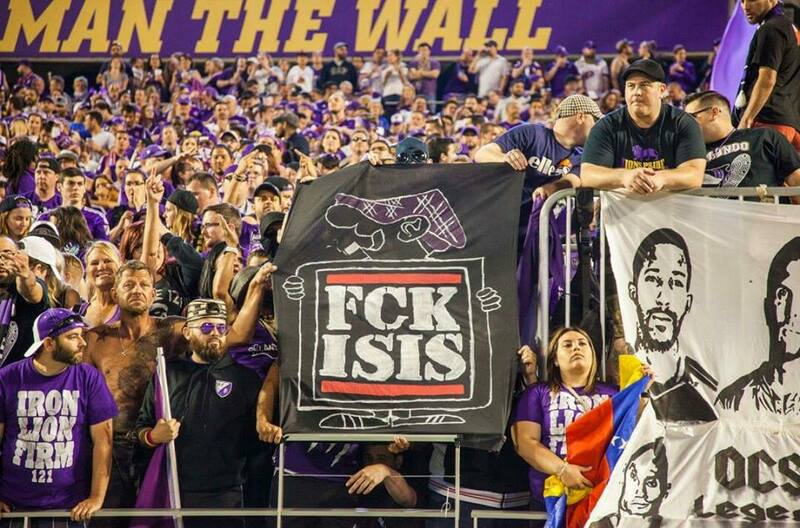 The Iron Lion Firm are completely independent from Orlando City Soccer Club and are entirely self-supported. 3. Do I have to be a member to chant with you guys? No. We welcome all OCSC fans who want to help us support the team throughout the stadium. 4. What if I don’t know the lyrics to the chants? 5. What should I wear to the matches? We do not dictate to our members what they should wear on match day. While most ILF members and those in the supporter section wear purple, you are free to wear what you desire WITH THE STRICT EXCEPTION OF JERSEYS OF OTHER CLUBS BOTH DOMESTIC AND FOREIGN. 6. Can I bring friends? Of course. However, you will be responsible for ensuring that they chant and respect the rules of our section. Don’t bring them if they aren’t going to participate or will disrupt the group. 7. What is the group policy on alcohol? 8. Is attendance at all matches mandatory? By definition we are a supporter club. We exist because we support Orlando City Soccer Club. As a member of the ILF, we expect you to try and make it to every match and official 'ILF on Tour' match in supporting our team. We understand however that work, school, financial and family obligations are sometimes unavoidable. In other words try to make as many matches as possible. 9. What is the difference between the Iron Lion Firm and the supporters groups across the league? We differentiate ourselves by our mentality, standards, and philosophy that are firmly rooted in the global and Latin American 'barra brava' culture. It is a level of commitment and sacrifice defined by Orlando City Soccer Club and the Lions as being among the top priorities in our lives. 10. What is a tifo? Tifo is an Italian word that describes the various visual displays that supporters around the world use to inspire their teams, diss rival teams/groups, express pride, or send a message. Tifos come in many different forms like flags, message banners, card choreos, overheads, two-poles, smoke bombs, etc. 11. What is expected of me during the game? Responsibilities are simple: Chant for 90 minutes; respect the group’s code of conduct; follow directions, particularly when we are displaying tifo; be in the section at the start of the match, stay the entire game and help wave flags. We also ask that you be responsible and control your alcohol consumption. Cleaning up puke and babysitting drunks is an unwelcome distraction during the game and interferes with our goal of supporting the team in a unified way. 12. What can I do to help the cause once I sign up? Give 100% at the games, travel with us to the away derbies, help with tifos, help promoting fundraisers, recruit new members, and contribute whatever skills and talents you have to improve the group.